for the learning2gether #ltis13 meeting. The work so far has been mainly done by Lucia Bartolotti, but there are still several passages marked “check” or “inaudible”. Claude suggests that if Learning2gether participants might be willing to have a go at editing the subtitles, that could be a practical introduction to the Amara software. If interested, visit http://www.amara.org/en/videos/YSU7qZTGsp94/en/506070/ -> Edit and resolve the issues noted. 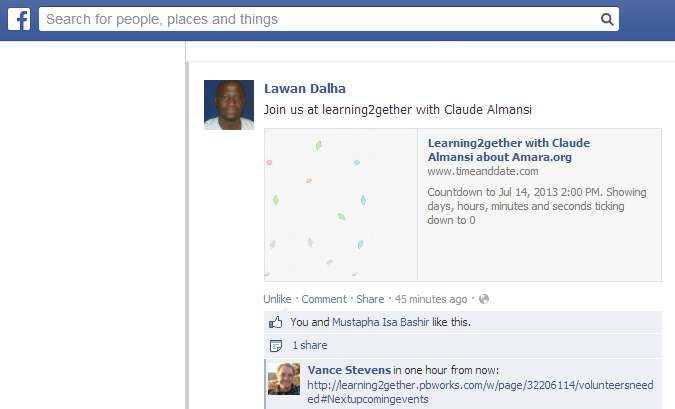 This is where Claude and her community have been putting a lot more information about Amara and other captioning tools and their potential for language learning. All are welcome to join us at this session and learn more about this and other captioning tools as well. “Are you using a Mac, perhaps? I’ve always had the same problem with the arrow keys commands on a Mac with the present editor. What I do is I stop the video with the tab command, then set the beginning and end of each subtitle dragging its edges on the time line. Not much point in asking for the arrow keys commands to also work on Macs in the present editor, as Amara plans to replace it with the new one rather soon. But I’ve mentioned the new editor’s issue with tab and shift tab in a Google spreadsheet I started when the NE was in total beta, i.e. only available on a special sub-site. See Let’s try the new subtitle editor and report about it on the Amara help forum. Sorry: your video hadn’t fully loaded when i wrote the previous comment. So yes, there’s a problem with keyboard shortcuts on Macs. But saving is a different issue, affecting ecumenically any user occasionally after the last upgrade. I.e. presently the system is running 2 editing tools – legacy and new – and so it maxes out at times. Therefore presently, do save and exit often when using Amara. If saving doesn’t work twice in a row, wait a few hours before trying again. Let’s hope things get better when the server starts running only the new editor. In http://www.amara.org/en/videos/YSU7qZTGsp94/info/fabrizio-bartoli-lucia-bartolotti-organize-a-discussion-of-the-cmooc-ltis13/ , “the video that is not a video” to quote Nina Liakos, what is streaming is an .ogg audio file I made from your original .mp3 and uploaded on the Internet Archive (see the “URLs” tab). For a while, .mp3 audio files could also be streamed in the Amara player, but that stopped working, though they plan to make it work again in the new editor. That’s why I went roundabout to get an .ogg file to stream. A list of file formats and video platform URLs that work with Amara is given in the Subtitle videos page where you can create a new Amara page. About the exchange with Nina Liakos on how to undo the connection between a YouTube account and Amara subtitles: see the How to undo Amara’s “Syncing to YouTube” discussion on the help forum.